Pedro Gomez DeBrito was born May 25th, 1959 in the Cape Verdean Islands. His family moved to Portugal when he was 9, then to the US when he was 15. He had started playing soccer at the age of 4 years old. He attended the University of Connecticut. Pedro played as a forward on the men’s soccer team and finished his four seasons with 43 goals and 59 assists. He holds the school’s career assists record and is fourth on the career goals list. In 1981, UConn defeated Alabama A&M 2-1 to win the NCAA Men's Soccer Championship. That year he earned first team All American honors. The Rowdies of the drafted Pedro with the first pick in the 1982 NASL College Draft. That year he was the NASL Rookie of the Year as a forward. He appeared in 29 games, scoring 2 goals with 4 assists. Prior to that Pedro played 2 games in the 1981-82 indoor season. In 1983, the U.S. Soccer Federation, in coordination with the NASL, entered the U.S. national team, known as Team America, into the NASL as a league franchise. The team drew on U.S. citizens playing in the NASL, Major Indoor Soccer League and American Soccer League. Pedro left the Rowdies and signed with Team America, where he played in 19 games and notched up 5 goals. When Team America finished the 1983 season with a 10-20 record, the worst in the NASL, USSF withdrew the team from the league and Pedro returned to the Rowdies. However, he did not play for the Rowdies in 1984 as the team traded him to the New York Cosmos on April 26th, 1984 for Refik Kozic and cash. While he played as a forward with the Rowdies and as a midfielder with Team America, the Cosmos used him as an outside back. Pedro remained with the Cosmos through the 1984 NASL outdoor season. The league collapsed at the end of the season and the Cosmos jumped to MISL for the 1984-1985 season. However, the Cosmos did not last the season and Pedro signed with the Dallas Sidekicks of the MISL as a free agent on September 10th, 1985. On February 13th, 1987, he injured his right knee putting him out for the remainder of the 1986-1987 season. He began the 1987-1988 season with the Sidekicks but the team attempted to trade him to the Tacoma Stars for Godfrey Ingram. When the two teams failed to complete the trade, the Sidekicks released Pedro due to salary cap considerations nine games into the 1987-1988 season. He then signed with the Wichita Wings as a free agent. Later that season, he broke his right leg. In 1989, he played for the Albany Capitals of the outdoor American Soccer League. 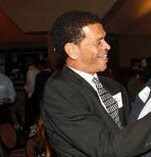 Pedro returned to the Dallas Sidekicks as a free agent in 1990 and remained with the team through 1991. On December 2, 1992, he signed with the Detroit Rockers of the National Professional Soccer League and played with the team until 1994 when he retired from professional soccer. After retirement, he spent some time in Portugal before returning to the United States and settling in Miami where he continues to play for local recreational soccer teams.